Known for most of her adult life by her married name, Alice Hargreaves, inspired the children's classic Alice's Adventures in Wonderland by Lewis Carroll, whose protagonist Alice was named after her. Her family surname Liddell is pronounced /ˈlɪdəl/. Alice Liddell was the fourth child of Henry Liddell, Dean of Christ Church, Oxford, and his wife Lorina Hanna Liddell (née Reeve). She had two older brothers, Harry (born 1847) and Arthur (born 1850, died of scarlet fever in 1853), and an older sister Lorina (born 1849). She also had six younger siblings, including her sister Edith (born 1854) with whom she was very close. At the time of her birth, Liddell's father was the Headmaster of Westminster School but was soon after appointed to the deanery of Christ Church, Oxford. The Liddell family moved to Oxford in 1856. Soon after this move, she met Charles Lutwidge Dodgson, who encountered the family while he was photographing the cathedral on 25 April 1856. He became a close friend of the Liddell family in subsequent years (see Relationship with Lewis Carroll below). Liddell grew up primarily in the company of the two sisters nearest to her in age: Lorina, who was three years older, and Edith, who was two years younger. She and her family regularly spent holidays at their holiday home Penmorfa, which later became the Gogarth Abbey Hotel, on the West Shore of Llandudno in North Wales. When Alice Liddell was a young woman, she set out on a grand tour of Europe with Lorina and Edith. One story has it that she became a romantic interest of Prince Leopold, the youngest son of Queen Victoria, during the four years he spent at Christ Church, but the evidence for this is sparse. It is true that years later, Leopold named his first child Alice, and acted as godfather to Alice's second son Leopold. (A recent biographer of Leopold suggests it is far more likely that Alice's sister Edith was the true recipient of Leopold's attention.) Edith died on 26 June 1876, possibly of measles or peritonitis (accounts differ), shortly before she was to be married to Aubrey Harcourt, a cricket player. At her funeral on 30 June 1876, Prince Leopold served as a pall-bearer. Alice Liddell married Reginald Hargreaves, also a cricket player, on 15 September 1880, at the age of 28 in Westminster Abbey. They had three sons: Alan Knyveton Hargreaves and Leopold Reginald "Rex" Hargreaves (both were killed in action in World War I); and Caryl Liddell Hargreaves, who survived to have a daughter of his own. Liddell denied that the name 'Caryl' was in any way associated with Charles Dodgson's pseudonym. Reginald Hargreaves inherited a considerable fortune, and Alice became a noted society hostess. After her husband's death, the cost of maintaining their home, Cuffnells, was such that she deemed it necessary to sell her copy of Alice's Adventures Under Ground. The manuscript fetched £15,400, nearly four times the reserve price given it by Sotheby's auction house. It later became the possession of Eldridge R. Johnson and was displayed at Columbia University on the centennial of Carroll's birth. (Alice was present, aged 80, and it was on this visit to America that she met Peter Llewelyn-Davies, one of the brothers who inspired J. M. Barrie's Peter Pan). Upon Johnson's death, the book was purchased by a consortium of American bibliophiles and presented to the British people "in recognition of Britain's courage in facing Hitler before America came into the war." The manuscript now resides in the British Library. Late in life, she lived in and around Lyndhurst in the New Forest, After her death she was cremated and her ashes were buried in the graveyard of the church of St. Michael & All Angels, Lyndhurst (a memorial plaque, naming her "Mrs. Reginald Hargreaves" can be seen in the picture in the monograph). On 4 July 1862, in a rowing boat travelling on the Isis from Folly Bridge, Oxford to Godstow for a picnic outing, 10-year-old Alice asked Charles Dodgson (who wrote under the pen name Lewis Carroll) to entertain her and her sisters, Edith (age 8) and Lorina (age 13), with a story. As the Reverend Robinson Duckworth rowed the boat, Dodgson regaled the girls with fantastic stories of a girl, named Alice, and her adventures after she fell into a rabbit-hole. The story was not unlike those Dodgson had spun for the sisters before, but this time Liddell asked Mr. Dodgson to write it down for her. He promised to do so but did not get around to the task for some months. He eventually presented her with the manuscript of Alice's Adventures Under Ground in November 1864. 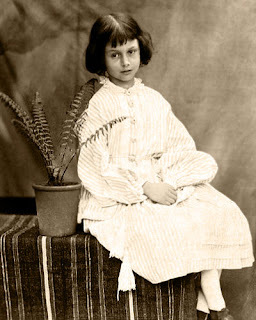 Anda sedang membaca artikel Alice Liddell | Origin of Alice In Wonderland. Artikel ini dapat ditemukan dengan url http://alicewonderlandstories.blogspot.com/2011/02/alice-liddell-origin-of-alice-in.html. Anda boleh menyebarluaskan atau mengcopy artikel-artikel di alice in wonderland ini jika memang bermanfaat bagi bagi orang lain, tapi jangan lupa untuk mencantumkan link sumbernya... terima kasih ! Jangan lupa klik tombol facebook LIKE di bawah ini ya.